10. Gennifer Brandon, Cal. The Cal Bears don't have one great player; there is no single, singular talent that jumps elevates an entire team, but they do have a collection of really good players. My favorite of the bunch is junior forward Gennifer Brandon, who is a rebounding machine and was a significant force in all of the team's signature wins this year -- once over Stanford and twice against both UCLA and Colorado. Make no mistake, the Bears won't make it far without Layshia Clarendon, either, but when Cal is at their best, they are a tremendously physical team. That physicality starts on the boards with Brandon. 9. 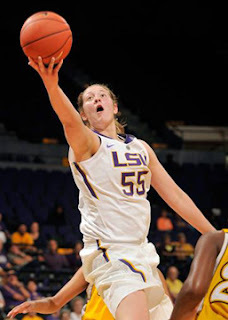 Theresa Plaisance, LSU. The Tigers were one of those blah teams, shuffling through coach Nikki Caldwell's second season in Baton Rouge and then it all clicked. They upset Georgia, then Kentucky, then Texas A&M during a seven game win streak which has propelled them to their No. 6 seed in this tourney. Powering them through this run is junior forward Theresa Plaisance. She leads her teams in points and rebounds, averaging more than 17 points per game and 8 boards per game, respectively. The Tigers go as Plaisance goes and if they get past Horizon League champ Green Bay in the first round (and there's no guarantee of that), they should have a really tough match up with Penn State. 8. Alexis Jones, Duke. Weeks ago, I had already penciled all-everything junior guard Chelsea Gray into this spot. I love watching her play. Then Gray suffered a season ending knee injury and I thought, there goes the Dukies best chance. Strange thing, but coach Joanne P. McCallie inserted freshman Alexis Jones into that spot and the kid has responded beautifully, with laser passes, soft dishes and quick hands. She's playing at a level nobody expected from a freshman. I have to admit that as terrific as she has been thusfar, this pick is as much out of curiosity as anything. I want to know -- how will she handle the pressure of the tournament? Is this a sign of things to come in the future for Duke, or a case of lightning in a bottle? 7. Maggie Lucas, Penn State. Every year I make this list, and every year I swear I'll get some new blood on here. Then I watch a Penn State game. Or two. Or three. The thing about Maggie Lucas is that her stats are great and by merely doing a Sabre-metrics type numbers crunching, she warrants a spot on this list. But Lucas is much better than that. She's a catalyst on the floor. When Penn State needs a lift, she gives it to them, whether it's in the form of draining a three, making a key pass, or getting a hand in a passing lane. Penn State is in the same bracket (Spokane) along with Cal and Stanford. I won't be at all surprised to see Lucas and Penn State pull a few upsets all the way to the Final Four. 6. Kelsey Bone, Texas A&M. In the Aggie's first year in the SEC, they kind of hung around the middle of the pack, had one or two really good wins and quite a few disappointing losses. Then the conference tournament started and it all clicked. In their first act, they knocked off #17 South Carolina. Then they bounced perennial queen of the mountain, Tennessee. And they followed that by knocking off Kentucky in the final. Through those three games on the biggest stage to date, the junior center contributed 18 rebounds and 40 points and it seemed like she got better with every game. I'm already looking forward to a potential Elite 8 Aggies v. Irish match up. 5. Amber Orrange, Stanford. 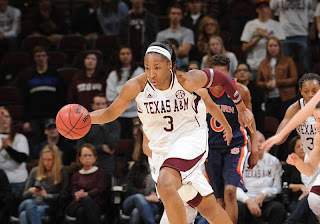 Much as I like Chiney Ogwumike's game, the player who has wowed me lately is sophomore guard, Amber Orrange. Make no mistake -- this is still Ogwumike's team -- but Orrange was positively electric in the PAC-12 championship game, able to take over when Ogwumike got in some foul trouble early on. She leads the team in assists, which I realize is kind in her job description. But she also leads the team in steals, so when you see the Cardinal in a breakaway, chances are she started it. 4. 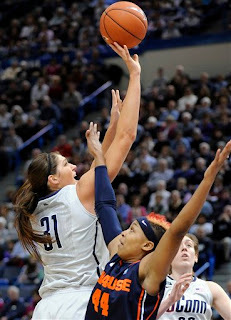 Stephanie Dolson, UConn. At the moment, the media darling on this Huskie team is sophomore forward, Kaleena Mosqueda-Lewis, but when the rubber meets the road, I want the ball in Dolson's hands. You know who agrees with me? None other than Geno Auriemma. To me, she is the most reliable player on the floor. Combine that with her size and quickness and she dominates the boards most night. And if she gets her hands on it, she will put it back. She could give seminars on setting a proper screen, alters every team's post-game and can guard out on the perimeter, too. Plus, she has that sweet little pull up jumper from the top of the key. 3. Elena Delle Donne, Delaware. The question around Delle Donne remains -- is there enough around her to get her through to at least the Sweet Sixteen? Delle Donne's talent is undeniable. She holds every record there is to hold at Delaware and in the Colonial Athletics Association. 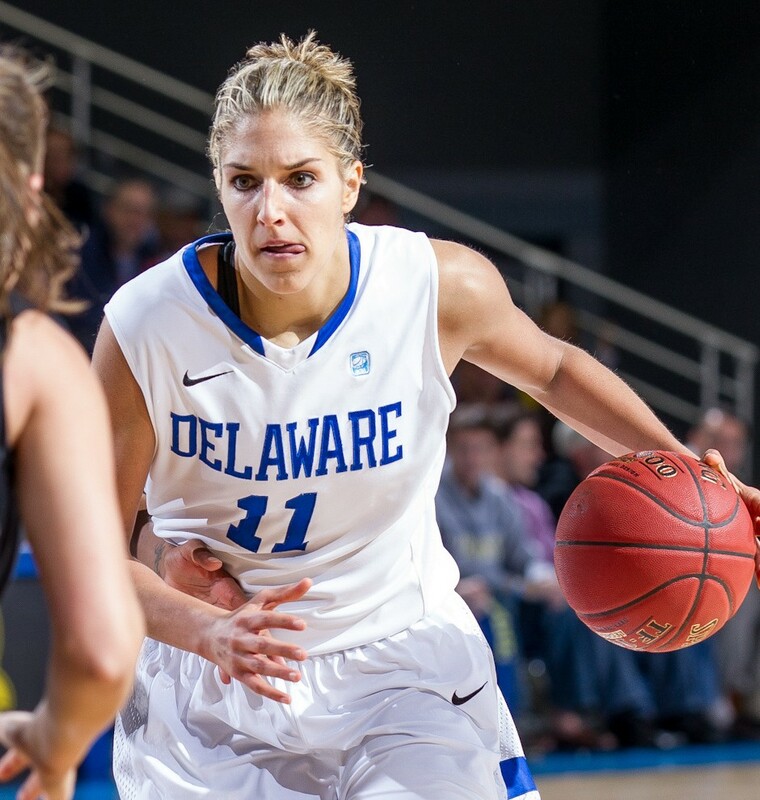 But we don't often get to see much of Delle Donne at tournament time because the Blue Hens often bow out pretty early. However, this year, they have a #6 seed. They face a very beatable WVU squad in the first round and could meet up with UNC in the second round. This might be the year when we get to see Delle Donne play into the second weekend. 2. 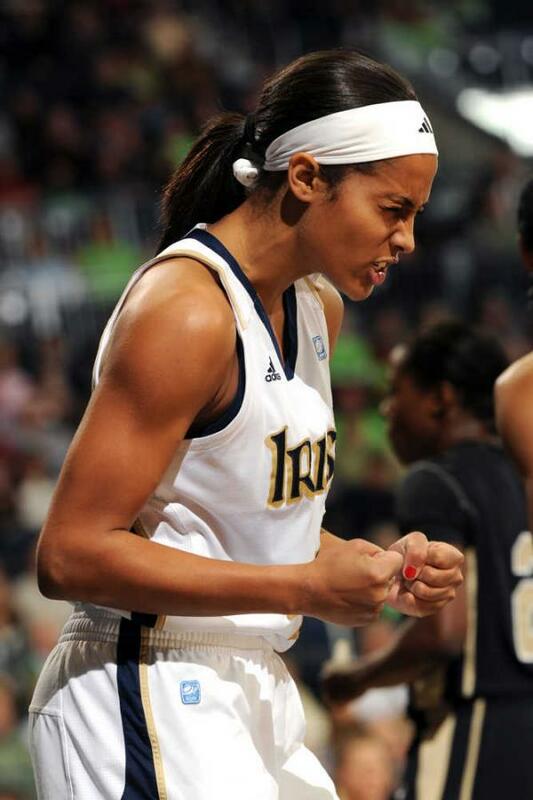 Syklar Diggins, Notre Dame. What can I write about Skylar Diggins that hasn't already been written? She's like having a coach on the floor ... Check. She's an unparalled leader ... Check. She has amazing court vision ... Check. She owns UConn ... Check. [Seriously, during the last UConn-Notre Dame battle, I got this text from my friend The UConn Fan: 'I'm tired of losing to these guys.' That's how good Diggins has been against UConn.] All of those things are true about Diggins, but I'd like to talk a bit about the magic of Diggins. Some players have a quicksilver ability to make an unbelievable play at the moment that just such a play is called for. Just when you think Notre Dame is down and out, Diggins dribble drives right down Main Street for the bucket. Or she makes an impossible pass to Natalie Achonwa inside. Or she hits a pull-up jumper. Or she sets a screen for Kayla McBride. Or she makes a ridiculous steal and dish, like this one. I've been watching Diggins for years now and this happens regularly. When I think the Irish are down for the count, she revives them. I don't know if even Skylar Diggins has enough magic in that bag to beat the unstoppable Baylor Bears, but I am rooting for this tourney to go chalk so that we can find out. 1. Brittney Griner, Baylor. For some reason, every time Griner dunks, it's a national whoop de doo, but to reduce Brittney Griner to her ability to dunk is to miss the point. Entirely. I'm not sure where this obsession with dunking comes from and Lord knows that Griner can throw it down, but she is so much more than that. One of the benefits of being a fan of the women's college game is that you get to see the best players for years, you get to see them grow and evolve and, hopefully, become more complete players. Griner was a phenomenal talent when she first hit the scene. But she was a very incomplete work. Her game was weak, from a mental standpoint. She could block. And occasionally dunk, but teams could work around her. In the last two years, however, she has matured into a complete player and that makes her nearly unstoppable. Her greatest asset is not her ability to dunk, but her presence on the defensive end. She greatly alters the shot selection of the opposition. When that happens, teams start to press and then Kim Mulkey's team goes in for the kill. If somebody out there has an answer to Griner, I haven't seen it yet. She is that good.